Three years ago, Deputy Chief Peter Sloly travelled to Minneapolis to meet with Chief Janee Harteau and observe the innovative efforts the city’s police to respond to its policing needs, particularly as it relates to the Somali community. 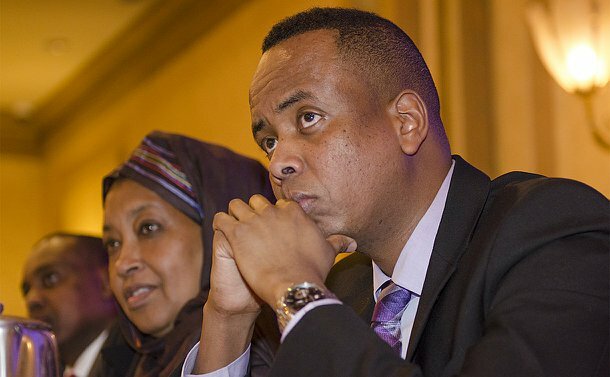 Minneapolis, with the largest Somali community in the United States, has attributed a decrease in violent crime in the Somali community to the presence of a handful of Somali police officers in their department. On his return, Sloly met with Faduma Mohamed of Positive Change Toronto, an advocacy group established to reduce gun violence in North Etobicoke, particularly in the Dixon Rd. and Queen’s Plate Dr. areas. Last year, several officers from 23 Division neighbourhood program visited Minneapolis. As part of the Toronto-Minneapolis Officers’ Exchange Program, officers Mohamed Abdullahi and Abdiwahab Ali of the Minneapolis Police Department came to Toronto last week to meet with police leaders and observe policing in the Canadian-Somali community, with whose leaders they also engaged in dialogue. “This is actually the most pure exchange program that I have been involved in in my 26 years of policing,” Sloly said, at a forum on January 17, organized by Positive Change and the Urban Alliance on Race Relations. “This is a great example of the community and police working together for best practices. Toronto Police spent about $500,000 to employ six officers in 23 Division as part of the Somali Liaison Unit, a renewable two-year project as a way to build trust in the predominantly Somali community and to engage youth. A refugee from Somalia, Ali joined the Minneapolis Police Department nine years ago. Toronto Police Services Board Chair Dr. Alok Mukherjee said the forum provided an enormously important opportunity for dialogue and discussion between members of the Somali-Canadian community and the police.